American Range 4.3 cu.ft. 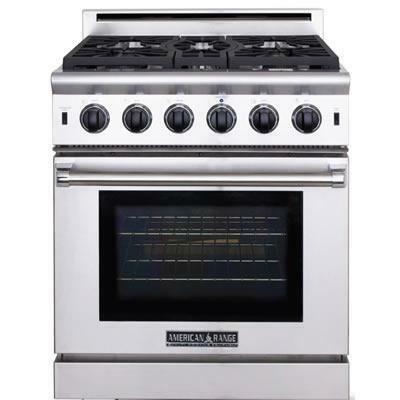 gas range features 5 sealed burners, convection bake, infrared broil and fan mode. Front panel switch controls oven lighting for optimal visibility. Continuous and flush commercial-grade cast iron grates allow for easy transfer of pots and pans across the entire cooking surface. And the sealed single piece tooled porcelainized cook top can hold more than a gallon of spills. Additional Information -INNOVECTION® CONVECTION OVEN TECHNOLOGY: Balanced turbulent heat distribution is essential when baking, roasting, and dehydrating food. 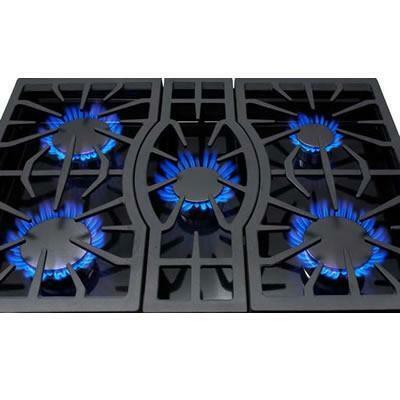 -Variable infinite flame settings for all sealed top burners. -Fail-safe system ensures re-ignition in the event the flame goes out even on the lowest burner setting. -Analog controls provide easy, push and turn operation ensuring child safety. -Blue LED light indicates oven functions. -Heavy metal die-cast black satin knobs with chrome bezels. 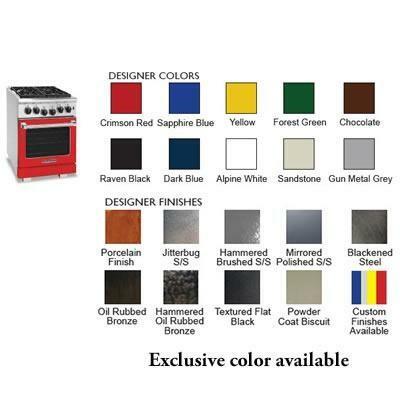 -Oven Features:Multiple functions include: Standard Bake, Innovection® Convection Bake, Infrared Broil and Fan mode. Two chrome racks glide at 5 (including base) cooking levels on heavy chrome side supports. Accommodates full size commercial sheet pan. Front panel switch controls oven lighting for optimal visibility. Oven front construction is a durable, precision-made one piece frame. -Gas Supply: 11" W.C Propane.